As the “Che Guevara” ferry lurched with determination across Lake Nicaragua, inching toward Isla de Ometepe, it was difficult to decide where to train your eye. On one end of the island is Volcán Concepción, an active stratovolcano whose frequent eruptions leave in their wake neat streams of ash that, when the wind is right, resemble the detritus of a giant smokestack. On the other is Volcán Maderas, Concepción’s smaller, lusher cousin. 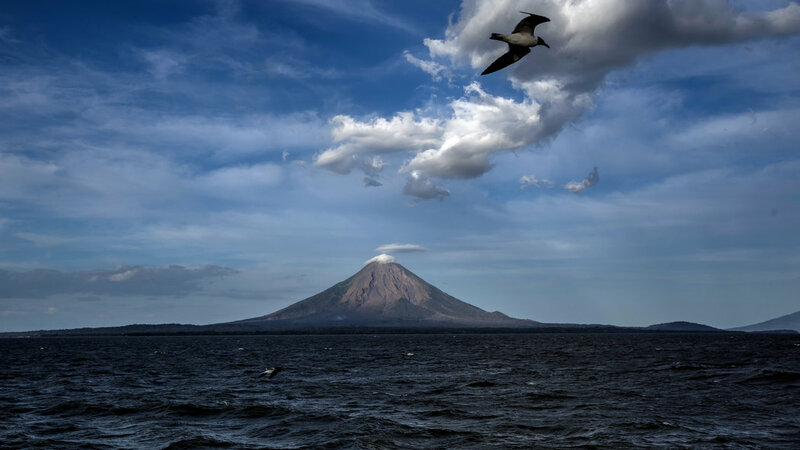 Regardless of where your gaze rests, the $3 ferry ticket (prices are often quoted in dollars in Nicaragua) is a bargain, considering the staggering view: a span of deep blue water bookended by two formidable summits, shrouded in swirling mist. Once you make landfall, the views go from dazzling to engrossing. The countryside at the foot of the volcanoes is blanketed by generous thickets of bougainvillea, poinsettia and hibiscus, palms and banana trees. The volcanoes dominate the roughly 100-square-mile island, though 30,000 mostly agrarian residents who settled there and a perpetual parade of tourists wedge their way in. Islanders ride horseback across grassy fields or herd goats, and young northern European tourists whiz by on mopeds. The 172-mile canal would run from Brito, through Lake Nicaragua, to the Caribbean Sea. 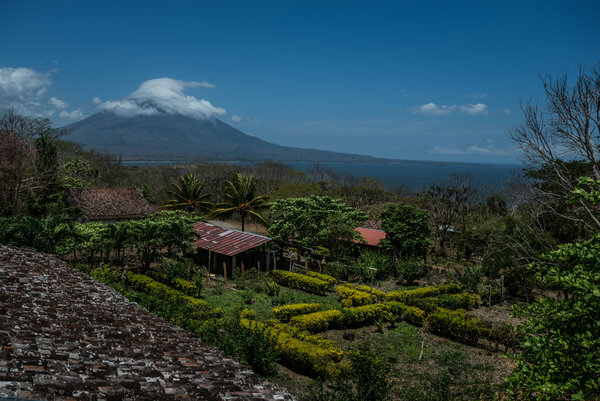 In the intervening centuries, Ometepe and Lake Nicaragua have remained a respite from occasional political and military flare-ups. In the civil war that ended 25 years ago, the region saw virtually no combat, since islanders went to the Honduran border or elsewhere on the mainland to fight. The beauty of Ometepe and the vast waters of Lake Nicaragua are two immutable constants that Nicaraguans can rely on. That is bound to change if Wang Jing, a Chinese billionaire, has his way. A consortium he led won approval last year from the Nicaraguan government to build a canal across the country. The plan, which would connect the Atlantic Ocean to the Pacific and shave about 500 miles off the shipping route from New York to Los Angeles, is the realization of a centuries-old dream that has outlasted the construction of the Panama Canal, about 450 miles south of the proposed route. In late December, workers began building access roads for the $50 billion canal. It represented enough of a step forward that it sparked protests. But the future of the project remains in question, not the least because of Lake Nicaragua itself. If the canal is completed, 55 miles of it would cut across the freshwater lake, transforming its bed and local rivers, but could also make this main source of the country’s drinking water no longer potable. This magnificent body of water could very well be both the inspiration that first led explorers dating back to Napoleon to dream up the canal and an obstacle that stands in the way of its construction. I visited Nicaragua in January and went to see Ometepe and the lake, where a good portion of the million-plus international tourists who visit the country every year go. The island is an essential element of a burgeoning eco-tourism industry, one whose selling point is the fact that Nicaragua has 0.01 percent of the world’s land mass but 7 percent of its biodiversity. The Nicaraguan government has yet to commission an environmental impact assessment on the canal plans. The company behind the canal, HK Nicaragua Canal Development Investment Company, or HKND, paid a private British firm, ERM, to do so. Manuel Coronel Kautz, president of Nicaragua’s canal authority, said the country’s leaders have confidence in the reports that have been done. “Both HKND and ERM are very serious and careful, and the Nicaraguan government has no concerns about the project,” he told me. “As to the Nicaraguan government conducting a feasibility assessment, which would include cultural, social and environmental impacts, our country does not have the money for this, ” he added, noting that the ERM feasibility study would be released by the end of April. With all of this in mind, I wanted to make my own assessment, as a tourist, of what stands to be lost to travelers. Like most visitors, I first saw Lake Nicaragua while traveling through the picturesque, vibrant colonial town of Granada, which sits on its northwest shore. After a jarring ride from Managua on the proverbial chicken bus — packed to the gills with passengers and crates of crowing roosters — I walked to the lakeshore, where gentle waves lapped at the wooden docks and the breeze brushed my face. I continued on to the desolate Centro Turistico, a lakefront park, and was gradually accompanied by Santo, a wizened and toothless man on a bike who offered to rent me a kayak as he ushered me along to a shop at the end of the park’s main road. There, I was introduced to Lorenzo, a young man from Las Isletas, an archipelago of more than 300 tiny tropical islands scattered about the northwest edge of the lake. After settling into our kayaks on the beach, we maneuvered across the choppy lake, finally reaching the quiet channels and lagoons of Las Isletas. Lorenzo teased me about bullsharks lurking in the depths — “four meters long!” he warned — though I had read they were practically extinct since 1969, when the Somoza dynasty, which ruled the country for 40 years, built a shark-processing plant in Granada. As we glided through Las Isletas, Lorenzo pointed out kingfishers and warblers swooping into the waters, swallows perched on lily pads and egrets gingerly traversing marshes. He grew excited at the yellow-chested oropendolas, with their ball-shaped nests dangling from tree branches, and then, barely visible in another tree, an iguana glaring down at us. At one point, he silently led me beneath a gargantuan mangrove and pointed with his oar under a limb before dozens of bats set off toward us. Women scrubbed and beat clothes against rocks and along the muddy banks, and children dived from high earthen ledges. We paddled around one island with a well-manicured manor house draped in vines and surrounded by waterside gardens and a metal fence. Lorenzo told me it was the vacation home of Violeta Barrios de Chamorro, Nicaragua’s president from 1990 until 1996. As we headed back to Granada, Lorenzo asked me if I knew about the canal. I nodded. 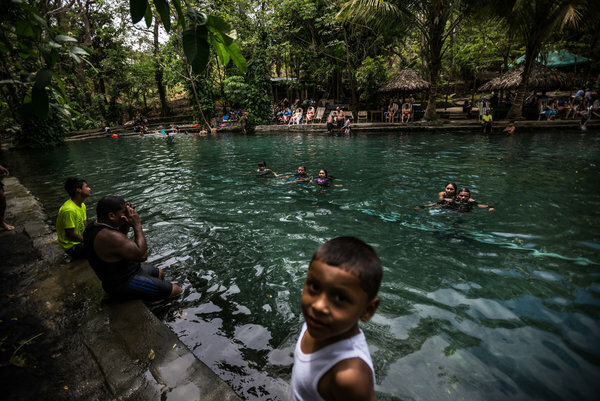 The canal project threatens not only Las Isletas’ residents, but also several of Nicaragua’s indigenous communities such as the Rama, Garifuna, Mayanga, Miskitu and Ulwa. The government maintains that the canal would provide an economic boost to a country sorely in need of one, where many earn $1 a day. The canal is expected to provide 25,000 jobs for Nicaraguans, HKND has said, and the Nicaraguan government projects that revenues could lift 400,000 people out of poverty in the next three years. The canal would, of course, also help line the pockets of interests beyond Nicaragua by providing a cheaper route that accommodates the increasingly large ships used to transport goods from the eastern United States to the West Coast, and from Latin America to Asia. The cost, however, is “staggering environmental devastation,” according to Axel Meyer, a professor of zoology and evolutionary biology at the University of Konstanz in Germany who has conducted ecological research in Nicaragua for 30 years. In a commentary written for the journal Nature last year, he and a colleague pointed out that the canal plans include rights to build and operate industrial centers, airports, oil pipelines and a rail system. Not only would the lake and its immense surrounding habitats be threatened by the required dredging, but the canal’s accompanying development could imperil tropical rain forests, including two reserves (the Indio Maiz Biological Reserve and the Cerro Silva Natural Reserve), Mr. Meyer said. That no independent environmental review of the project has been performed, Mr. Meyer told me, is not only suspect to those concerned with its potential effect but also troublesome for the builders themselves. “To have an international, independent review will be important if the Chinese hope for World Bank support, or any other type of international money,” he said. One of the habitats standing to lose much is Ometepe, which relies on the lake for irrigation and is home, Mr. Meyer said, to its own unique flora and fauna, including a lungless salamander first discovered and described in just 2008, and Tomocichla tuba, a relatively rare cichlid fish. 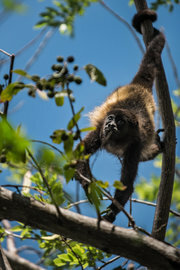 I followed him through the brush and under barbed-wire fences until we reached a shaded grove, where Enoc motioned for me to be still as he pointed upward at a family of white-faced Capuchin monkeys — some with babies on their backs — clinging to the highest branches, their tails leisurely unfurling downward. Afterward, Enoc drove me to a former tobacco and cotton farm now home to the Museo El Ceibo, which I had read exhibits mostly Nicaraguan coins and historical bills. I was initially unenthusiastic, not having much interest in numismatics, but quickly saw how the museum curators had cleverly used the córdoba, Nicaragua’s national currency, to illustrate the dramatic rise and fall of the country’s regimes, in part because every four years, the president gets to redesign it. The exhibit also highlighted the upheaval of wartime inflation, “when everyone got to be a millionaire,” Enoc said with an arched brow. From the museum, we drove to the Reserva Charco Verde, where we took the short hiking trail around the lagoon and watched butterflies swerve about, then we headed to the park hotel’s veranda for a late lunch. As we sat at the water’s edge, I asked Enoc about his family, and he told me of his wife and young daughter, and explained that he was building huts on nearby forestland, which he hopes to rent to tourists. It would take some time, he said, as he continued to work as a tour guide. A few days before visiting Ometepe, I flew from Managua in a single-engine Cessna typically used to transport FedEx parcels to the area that would be the potential starting point of the canal. 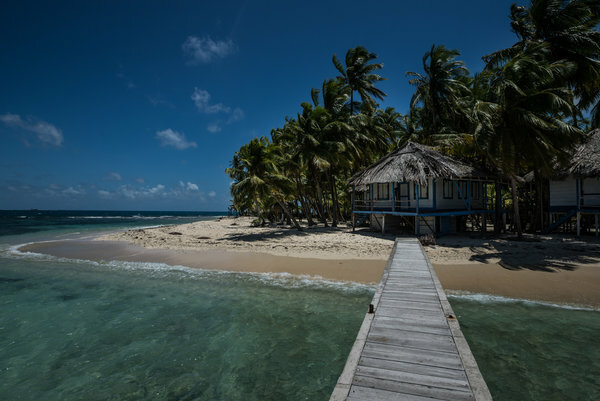 My plan had been to visit Pearl Lagoon, on the Caribbean coast, but as we landed, sheets of rain and heavy wind tossed the plane, and I knew the boat ride there was out of the question. My more immediate problem, however, was reaching Casa Rosa, a fishing lodge outside Bluefields where I had a reservation. A fellow passenger on the plane warned me that the road leading to it swells and floods during such a deluge, and he offered to arrange a jeep to get me out there. En route, we passed shanties and dilapidated Victorian homes enclosed by broad porches, echoes of this once-prosperous Dutch settlement, and also the graceful white and stained-glass Moravian church built by German missionaries in 1849. Rosa met us at the end of the road leading to her sprawling hacienda. Her American husband, Randy, was out at sea, and as she prepared a shrimp lunch for me, I listened to her tales of fishing trips she and Randy had taken around the Caribbean, as she pointed out trophies for prize catches and framed, sun-blotched photos of jumbo tarpon. I was the only guest that evening, and later, after showing me to my modest room, she led me to another down the hall. It was spacious, with a sweeping view of the bay. This is where President Daniel Ortega stays overnight, before heading out on fishing expeditions with Randy, Rosa told me with a wry smile. I woke early to sunny skies and headed for the harbor to board a panga, an outboard-powered fishing boat, for the Pearl Lagoon, but ended up having to wait, inexplicably, two hours before we shoved off. Weighted down with far too many passengers, and mounds of frayed baggage and ice chests packed with beer and food, we zipped through canals and sluices for an hour before I could see a kaleidoscope of thatched-roof bungalows on the shore. Rosa had told me to ask for Casa Ulrich at Pearl Lagoon, and after a local at the harbor pointed me in the right direction, I found the proprietor, Fred, dozing on a hammock. After his wife woke him, and I introduced myself and asked about tours of the area, he looked at his watch and then said that he had bad news for me: The last boat back to Bluefields would be in a few hours, allowing too little time to visit the Pearl Cays, as I’d hoped. But there was the lagoon, Fred told me, and he’d lend me his kayak. After pushing out, I dodged divebombing albatrosses and watched fishing boats and pangas ply the bayous. When I returned to Fred’s pier, he offered me garlic-sautéed lobster, chuckling that he hoped he could compensate for the slippery logistics of visiting Pearl Lagoon. As I ate and Fred sipped beer, he pointed across the water at half-constructed stilt huts in anticipation of more tourists. Among the half-dozen canal routes drawn up through the years, he then told me, at least two would have touched the Caribbean just south of here, which could potentially mean more visitors. 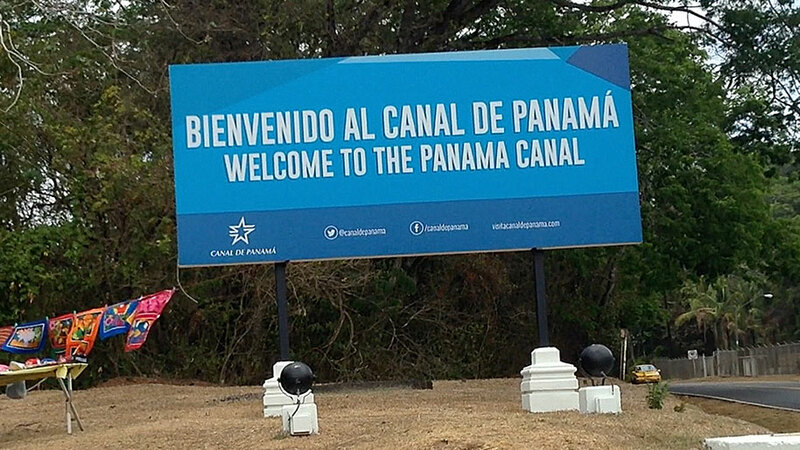 If you want to imagine what the canal could bring, look no further than Panama, where its canal’s locks are being expanded to increase capacity. Panama City, with its glistening skyscrapers, is a towering reminder of the canal’s significance to world trade. The creation of the Panama Canal predates what we think of as ecotourism, but now that such a thing exists, Panama is known for its biodiversity in some parts. Its Caribbean coast offers surprisingly vibrant sights for scuba divers, and the country is home to 17 national parks. But it isn’t Costa Rica. Its residents didn’t forfeit a massive freshwater lake in exchange for a bustling economy either. Regardless, the prospect of Nicaragua’s canal perhaps provides the best reason to visit the country now, adding drama to what might otherwise be a pretty postcard tour of the tropics. I think of this when I recall my lunch with Enoc on Ometepe, when he pointed to the lake and at the Isla de Quiste, and beyond, two ferries shuttling between the island and the mainland. I took a long moment to absorb the dreamlike view, noticing the particularly tranquil waters stretching toward the horizon. Elizabeth Zach is a fellow at Stanford University’s Bill Lane Center for the American West. She last wrote for the Travel section about the nation’s first fracking ban in Mora County, N.M.
Panama Canal Authority Administrator Jorge Quijano said he doesn’t expect a planned rival waterway in Nicaragua to be completed because it won’t be able to compete economically with his shipping channel. “There’s very little hope for actually getting such a canal built because of the competitiveness of the Panama Canal,” Quijano said Thursday in Singapore, where he was attending a conference. For investors in the Nicaragua project to get a return that they will accept, that waterway would need to charge tolls twice as high as those for the Panama canal, Quijano said. “So it will not be competitive,” he said. Nicaragua in June 2013 granted Chinese telecommunications billionaire Wang Jing’s HK Nicaragua Canal Development Investment Co. rights to build an inter-oceanic canal that the Central American nation projects will cost $50 billion and take six years to complete. The new waterway would be more likely to take 14 years to build and cost as much as $70 billion, Quijano said. The official construction estimate “is very, very compressed,” he said. Wang’s Hong Kong-based HKND Group has a 50-year concession to build the new canal. The estimated cost is more than four times Nicaragua’s 2013 gross domestic product. A $5.3 billion enlargement of the Panama Canal is likely to be completed by the first quarter of 2016. Quijano said in August last year that officials are studying whether to dig a fourth set of locks to handle the growing fleet of super-sized ships as the current expansion, which was approved by voters in a 2006 referendum, may not be enough. Wang is chairman of more than 20 enterprises in 35 countries, including Beijing Xinwei Telecom Technology Inc., according to HKND’s website. HKND describes itself as an international infrastructure developer that will design, build, and operate the canal, its first project. HKND didn’t immediately respond to an e-mail seeking a reaction to Quijano’s comments. Work on access roads for the construction of the Nicaraguan waterway started in December 2014. PANAMA CITY — Giant backhoes claw into the ground, as helmeted workers position rebar atop of concrete pillars 100 feet tall. Cranes, trucks and teams of workers toil through a construction site here large enough to fit three Empire State Buildings, laying end to end. The two projects are unrelated but tightly intertwined: One aims to release massive 1,200-foot-long container ships, the other to receive them. The much-anticipated $5.25 billion expansion of the Panama Canal — the historic 48-mile waterway that snakes a watery path between the Pacific and Atlantic oceans in this Central American country — has been marred by delays and overspending. But its scheduled opening in April 2016 will allow some of the biggest ships in the world, able to carry up to 14,000 containers, to cut a quicker path to U.S. ports, particularly those on the Eastern Seaboard. The expansion project was a key topic of conversation at last week's Seventh Summit of the Americas, which drew leaders from 35 countries in the hemisphere. President Obama visited the canal during his two-day visit here. The expansion was scheduled to be completed last year, in time for the canal's 100th anniversary, but cost overruns and labor disputes delayed it. Meanwhile, U.S. ports are busy deepening harbors and building bigger terminals to draw the bigger ships. Across the USA, public ports and their private sector partners will spend more than $46 billion in port-related improvements through 2016, according to the American Association of Port Authorities. "It's the era of big ships," said Richard Larrabee, director of the Port Authority of New York and New Jersey, which is overseeing a $6 billion upgrade to its harbor, container terminals, rail lines and bridges to draw the large ships. The Panama Canal "opened up the notion that we could see ships twice the size we normally do once the canal was opened. That was the real impetus for us." Many of the U.S. projects are driven by a variety of factors, the canal expansion being just one of them, said Kurt Nagle, president of the port authorities association. But the Panama Canal Authority's ambitious goal of keeping up with the trend of larger cargo ships has been a model for many U.S. ports, he said. "The Panama Canal is a great poster child for what the United States needs to do if we want to stay competitive in international trade," Nagle said. Ever since the SS Ancon became the first ship to transit the newly opened canal in 1914, the Panama Canal has been cloaked in history and dark myth. 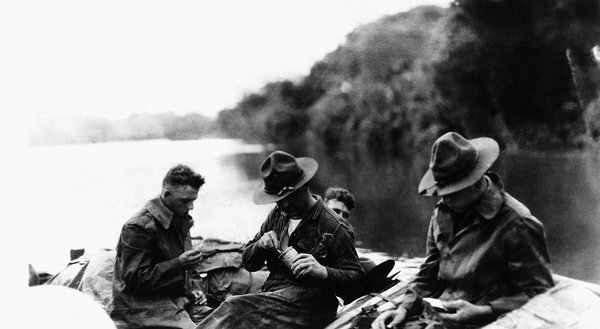 Cholera, malaria, dysentery and yellow fever claimed the lives of more than 22,000 workers who labored to dig the canal through the tropical jungles of the Isthmus of Panama. Taking 33 years to complete, the canal transformed global trade, greatly reducing travel time between the Atlantic and Pacific by allowing ships a shortcut rather than traveling around the tip of South America. 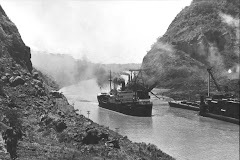 Creation of the Panama Canal "affected the lives of tens of thousands of people at every level of society and of virtually every race," historian David McCullough wrote in his seminal account of the canal's building, The Path Between the Seas. "Great reputations were made and destroyed. For numbers of men and women it was the adventure of a lifetime." Its expansion has similar scope and ambition. The mammoth new locks sit alongside the existing Panama Canal and will allow ships carrying up to 14,000 containers to pass. To build the original canal, workers excavated 7 billion feet of material and poured 113 million cubic feet of concrete, said Luis Ferreira, an engineer and spokesman with the Panama Canal Authority. For the expansion project, workers have excavated 5.5 billion feet of material and poured 155 million cubic feet of concrete, he said. "It's like building a new canal," Ferreira said during a recent visit to the construction site. Engineers are now studying the feasibility of building a new set of locks that will allow even larger ships – those able to carry up to 20,000 containers – through the canal, he said. Those studies come on the heels of recent reports that a Chinese businessmen is pledging to build a rival $50 billion canal through nearby Nicaragua. The trend of larger ships and pathways is not lost on Noel Hacegaba, chief commercial officer at the Port of Long Beach in California. Theoretically, the Panama Canal expansion poses a direct threat on his bustling port, if big ships choose to cut through the canal and head directly to eastern U.S. ports. But Hacegaba and his port partners are betting they can still draw the big ships directly from the lucrative Asian routes, despite a recently resolved West Coast dockworkers strike that shooed away a lot of business. Port officials there are building a 304-acre "mega-terminal" and 205-foot-tall bridge to accommodate bigger ships, he said. The $4.5 billion package of projects should be completed by 2019. "The pace at which these ships are growing is forcing all the ports to modernize and expand," Hacegaba said. "For us, it's been a real game changer."